Re-use that comb. Start again! With our changing weather and up-and-down temperature extremes, Mother Nature is not kind to the bees nor to us humans. Deduce that your colony did not die to disease (American Foul Brood, AFB) or pesticide exposure. Under these conditions, the hive will need to be destroyed (burned) or the comb eliminated due to the toxins in the combs and food stores. Remove the dead bees by lightly shaking and brushing. Do not crush the dead bees. Don’t worry about the bees inside the cells. They will dry out and will be removed by the successive bees of the colony. Put the hive body and comb on a strong colony. Yes, the bees will clean up the comb. Close up the hive. Do not let it get robbed out or damaged by other bees. Get a new queen and learn how to make a split-colony for increasing or replacement. 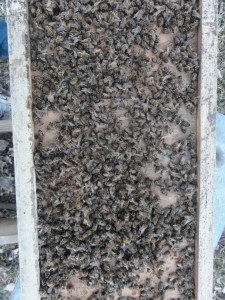 Or, use several of the best combs on a new bee package or nucleus for growth. If there were any mice nests or extreme damage, there would be a strong smell of urine on the damaged comb-replace or destroy. Bees do not like mice urine. Dead colonies or ‘dead-outs’ are a terrific resource and opportunity to begin again with bees. Protect the hive and combs! While it’s a terribly disappointing loss, as long as it was not a disease that killed off your colony, it will be a tremendous resource advantage to start again. It’s late winter/early spring. I have a colony where the bees are alive but the population amounts to only a few hundred bees surrounding the queen. What should I do? There was a very high mite population last fall. Or, your queen was probably sick with Nosema infection, which starves the queen and affects her egg-laying. Tiny colonies do not have sufficient population and will not build up. Let them go! Tiny colonies will most likely die out in January, February, or March cold snaps when the temperatures drop below 20F. If the colony has not died out on it’s own and you have additional hives, you can kill the queen and use the remaining population by shaking them in front of another hive. Estimates are that nearly 50% of swarms in the wild do not make it through their 1st winter! Amazingly, honey bees have a way of finding these ‘natural dead-out colonies’ and moving in to take-up housing before there is any infestation by wax moth. 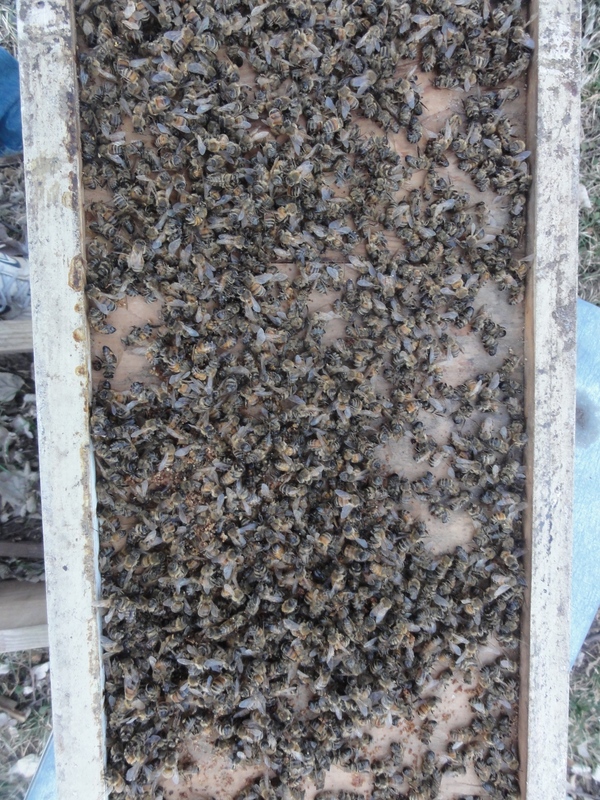 As a starter resource, these 2nd swarm colonies have an even better chance of being successful through the following winter than the initial colony did. This is how it works in nature! Wax moths are a secondary problem. The wax moth larvae damage comb by tunneling and eating their way through. They are in search of protein! Larvae get it in the form of stored pollen and the pupae castings or cocoons and wax from the brood comb. The larvae develop faster in warm temperatures in early summer and through out fall when it’s over 90F. Typically, we do not see them in our area of NE Kansas until mid-May or later. Comb and equipment need to be re-started with package or swarm bees by mid-to-late May or you risk having a problem with wax moths. When wax moth larvae pupate, they gouge wood. The bees cannot remove the pupae or the cocoons. These can be scraped and removed. The gouges in the sides of the hive body will be filled in somewhat with propolis by any new colony. Beekeeping has been described as a passion of the natural world, a great responsibility, and a rewarding stewardship –nature, science, art, and chance all rolled into one endeavor. We encourage you not to give up. Become an active member in the association. Meetings are meant for opportunities to learn and share experiences. We exist to educate and mentor for the benefit of beekeepers. There is not better advice than to become part of the group. You will learn the benefits, pitfalls, and experiences of regional beekeeping. Beekeeping is considered local; providing a common forum for success. These tips were inspired by: Becky Tipton, February 7, 2015, FB, in response to a beekeeper who had reported that he had lost his colony. This entry was posted in Beekeeping, NEKBA by Robert. Bookmark the permalink.